I was on a quick errand in old Ballard the other day to scout a birthday gift when I made an impromptu detour to see the holiday-dressed windows of Curtis Steiner's shop, which was in the 'hood. This has become an annual holiday destination for me as Curtis always creates the best-decked windows in Ballard and beyond. This year his display stopped me in my tracks and I had to drift inside to see more. 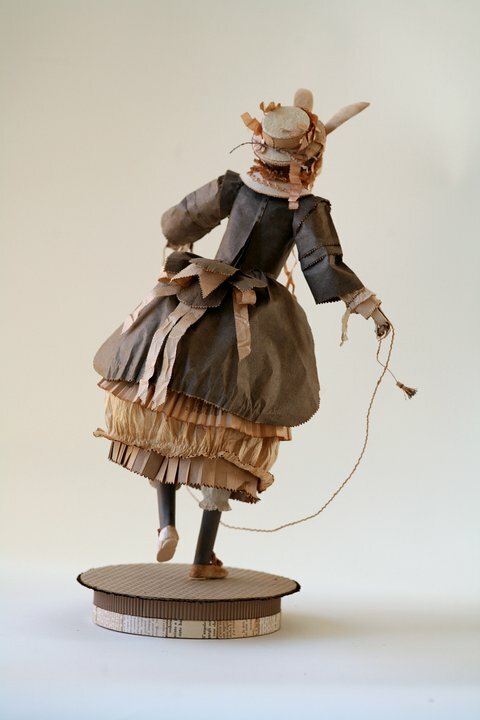 On display until December 23rd is the lovely paper sculptures of Patty Grazini, a very talented Seattle artist. 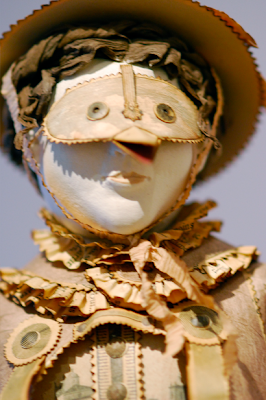 Visiting this new exhibit of Grazini's paper sculptures is like walking back stage of a puppet theater and peering behind the curtain. Patty does things with paper that defy its' physical properties. 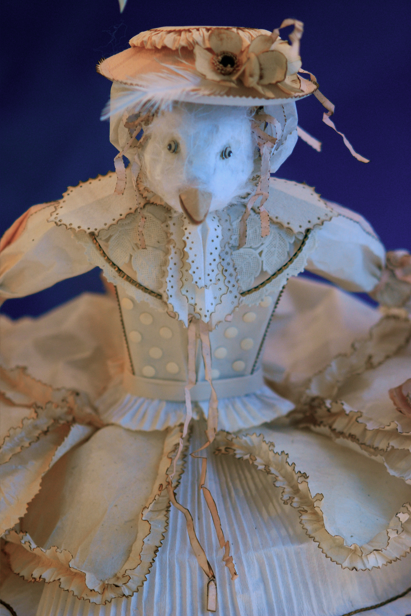 Each theatrical character she's created is something out of a fairytale—if Fellini had imagined it. They stand about 18 inches tall and are dressed mostly in 18th C costume made entirely of beautiful, old paper—many pale shades of faded black and white patterned papers, with many words, letters, and textures—and each of her characters has a personal narrative to tell. 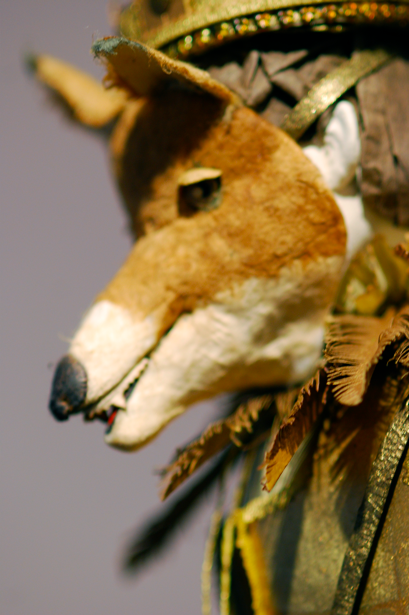 The figures each hide behind animal masks, and with further study, a demure paper mache face is revealed beneath it. A white bird with feathers in its' bonnet carries a bow and quiver and has tiny envelopes hanging from a paper string on the belt of her skirt. 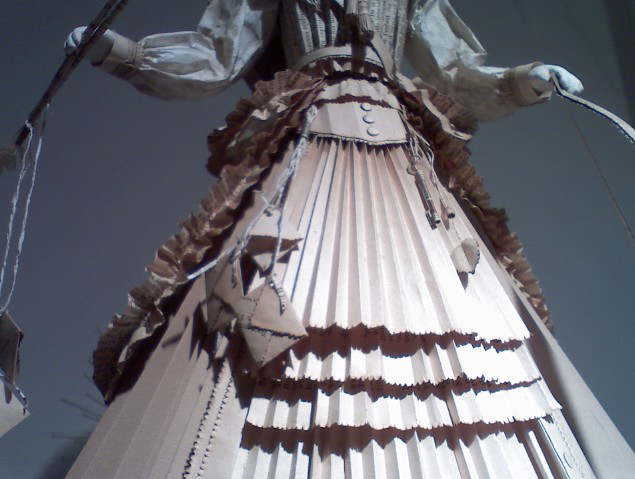 On the other side of her skirt hangs a heart and a key. A wolf-faced woman with a cape looks like she stepped right out of Red-Riding Hood's tale. 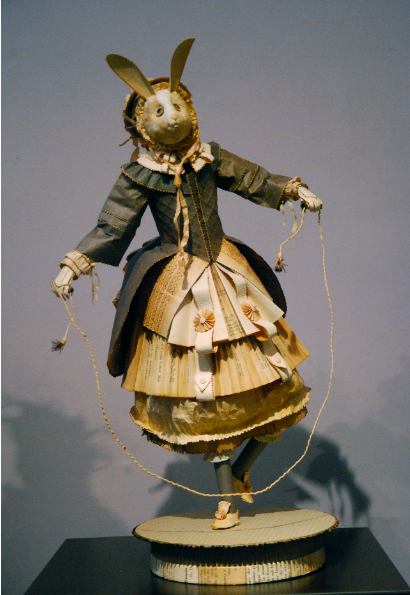 A rabbit-faced character jumps rope wearing her best Easter clothes. And a young swan is swinging from a cloud surrounded by a wreath of paper stars in the front window. 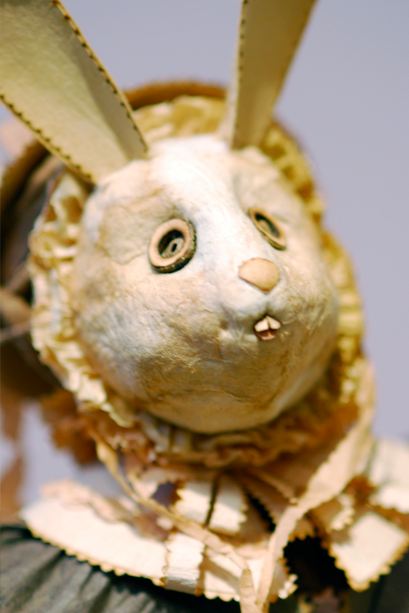 There are several more story-book characters on display, and I highly encourage you to see them in person if you are anywhere near Seattle or the West Coast. 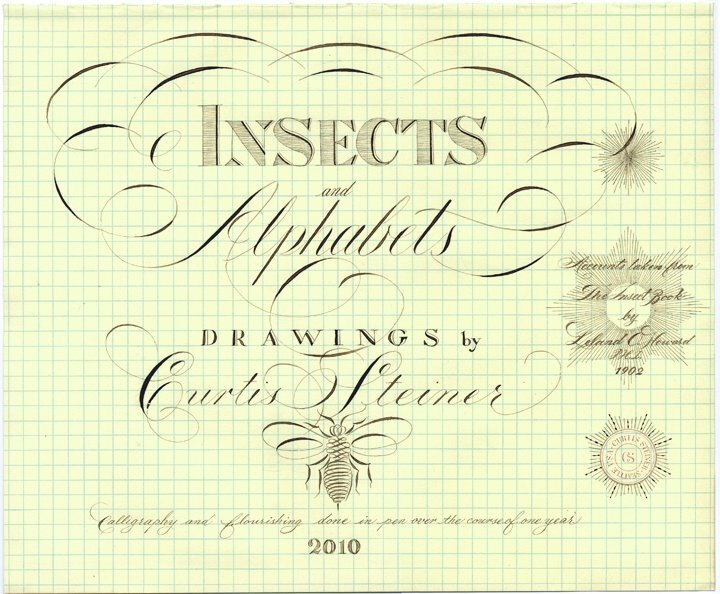 And not-to-be-missed on your visit to Curtis Steiner's store, are the stunning insect & alphabet samplers which he has produced over the course of this past year. 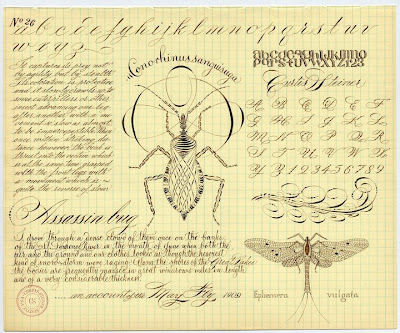 They each feature beautiful calligraphic insects with decorative roman and script alphabets and flourishes. Very inspired work indeed and I am grateful to Curtis that he's offered me to share all of this with you here. OMG. I want to go to there! Wow. Both are delicious. 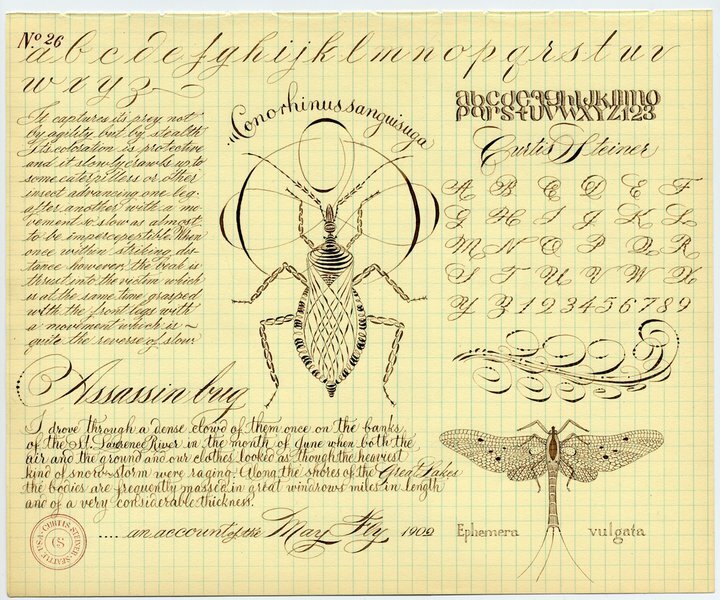 The first have a magical, mysterious air to them, the second, since I'm a biologist who loves either old bio writings and drawings or things that look like old bw and ds, makes me swoon. Thanks SO much for sharing! Curtis Steiner's drawings and calligraphy are absolutely stunning!!! Is his work for sale anywhere?!?!? Lovely blog, really enjoyed looking through your posts!